Hello to everyone for Arizona! My new companions (yes, plural) are Elders Brose and Burr. Elder Brose is hard of hearing but knows sign language really well and is a really happy and upbeat Elder. Elder Burr is kind of like me except he's been out for a while so he knows more. Next week, Elder Brose will be transferred to another area to start proselyting in English so Elder Walker will be his replacement. I have only just met him, but he's a nice guy. My mission president is nothing like I expected and really neither is his wife, but they're really nice people. Surprisingly enough, my first day in Scottsdale is a cloudy one with a decent amount of rain. I've seen several different Cacti that I've never seen before in my life and it is so strange down here with all of the sandstone colored buildings everywhere. Less than an hour in the state and they had me take a driving test to see if I would be worthy enough to drive one of their cars. I have yet to meet any deaf investigators or to meeting any members in the branch, but I am so looking forward to it. I'm going to be in a car for my entire mission (from what my Mission President told me) so I won't need to buy a bike, but I will be staying in Arizona, mostly hopping back and forth between Phoenix and Scottsdale. 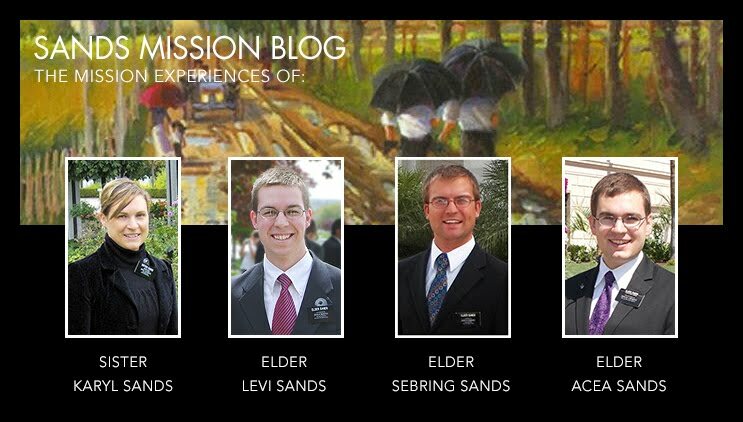 I just want to let you know Elder Sands has safely arrived. What a great missionary! We are so excited to have him. President and Sister Sweeney picked him up at the airport. He has already met his ASL companions, interviewed with President Sweeney, taken his driving test with our Vehicle Coordinator and received his MSF card from the Finance Secretary. He is glad to be getting into the swing of things! We have a large group of new missionaries arriving next Monday. At that time, pictures will be taken and I will send you copies. Monday is generally preparation day, but it will be Wednesday next week due to the transfer cycle. I don’t know if he will get to email today. If you don’t hear from him today, you will next Wednesday March 4th. Thank you for raising such a fine young man to serve the Lord. We promise to keep him busy! And take good care of him. May I recall to your memory “Dating 911” by John Bytheway where he share the story about the top 10 things women do to avoid going on a date. Oh yeah: HAPPY VALENTINE’S DAY EVERYONE!!! Thanks for writing me so consistently and nicely and sharing things about your life (*cough* Levi *cough*). I wish you both the best of luck as you bring a little terror...Soul, I mean, into the world. Just kidding, I hope you have fun though. Sorry guys, I labored so hard to get the few pictures I did; by the sweat of my brow did I take those pictures, and there are not very many of them and they’re not the best, but I have a hard time getting good shots. You should see the pictures I have of my companion. They’re so much better than the ones he takes of me. I wish I could take a picture of myself, oh wait, that’s a selfie. I’ll keep trying, and I might want to wait till I get to Arizona and see if there’s any good opportunities for good pictures there. Wow I have run out of time about 45 minutes ago, I just have so much I need to do. Now all of you would be so surprised how much talent is here at the MTC. The Spirit of the lord is definitely part of it. There’s always just enough singers and piano players and all of them are very talented. I was able to find someone, practice with them for a half an hour and then audition the next, and perform the next after that and we sounded great. This singer, Sister Bell, was so good, she could hit the A-flat 2 octaves above middle C. For those musically inclined are probably going “oh wow” right now. Wow, Dad thanks for sharing that spiritual experience-that was just really so cool that that happened-your right, Heavenly Father is always waiting to help us in His work. Here at the MTC. Every meeting that involves more than 1 zone has to have a special musical number. Now why do you think that is? A little strange right? But let me tell you something. Music, something that I’ve just recently learned, brings something into a meeting that nothing else does. And to add to its wonder, the Lord is always with those to play and bring the spirit. We often have less than a week to prepare and song for the entire MTC and it always turns out great. After every SMN there’s a sweet feeling no speaker could bring. Please keep this in mind the next time you sing in a church meeting or listen to another’s performance, you will notice a difference when you start to pay attention to it. As for my past week, everything is going great. The language is a little tough but I’m getting used to it fast. I recently found out that while our teachers are signing, they mouth the words, and some of them even whisper while they do so. I’ve found that instead of getting better at signing, I’ve been getting really good at reading mouths. So when we got another teacher this past week, and she started signing without mouthing I was thinking “That is not the language they have been teaching me these past few weeks.” Thankfully I’m still in the MTC and can fix that...hopefully. I’ve been talking with the teachers to see if we can find a more deaf-like way of teaching. NOTE: 4 NEW PICTURES! CLICK ON THE PICTURES TO THE RIGHT TO VIEW THE PICTURE ALBUM. May I first begin by giving a nice warm, friendly, nice, long, good, kindhearted, cheerful, wishful, well-wishing, comforting, funny, annoyingly-long, detailed, warm-hearted, happy, loving HAPPY BIRTHDAY to Uncle David, and Amber! I miss you guys and wish you a...well, you get the idea. Also, to all who read this letter, please read ALL the things I write, regardless of who it's addressed to. Things meant to apply to other people can still apply to others in unforeseen ways. I also like to think I make some pretty good jokes every now and then (or at least make you look down and shake your head thinking "my goodness"). Oh, "Jesu, joy of man's desiring". Nice. Sorry, I’m listening to the MOTAB music stream. It's one of the few approved music sources at the MTC. I'm super excited for both of you. One of my teachers got married about the exact same time you guys did and they're going through similar things so don't sweat it too much. But is vomiting out of a moving car considered littering...? I remember just yesterday my companion and I were watching Br. Featherstone (our only deaf teacher [and the best]) teach one of us on a one on one basis. He was talking about attending church and how important it is and he was SO DIRECT it was kind of scary, but that's the way the language works and it turned out really well. I guess with the spirit, even the blunt can be sharpened into a sword to piercing even the hardest hearts. Since I’m the only accompanist, I get special privileges of being able to request music from my personal archive (AKA: you dad) whenever I’m out of class. I don't want to write all of that! I’ll just sign it and write the rest of it"
"Wait, how to you write the sign for 'for example'?" "Ugh, I guess you can't write sign language. That’s annoying"
"Okay, I guess I’ll have to write it all out..."
Even as I write I’ll hesitate on big words or phrases and will want to sign it, because it's like, 100x faster to sign than write it. I bought a shoulder bag here, it has been recommended that I have it, and a CamelBak for my mission so I just bought it here at the MTC. I also purchased a card reader. Let’s see if it works. As for all the music I’m doing, the Lord is totally incredible. He helps me learn all these things fast enough to play them perfectly in front of 1000 missionaries and General Authorities every Sunday with only an hour of practice. It's pretty awesome. I apologize for the short letter last week, as I was short on time but I just wanted to share something with you all that I learned this week that I thought was really nifty, useful, powerful, and something I have seen work firsthand. Close your eyes (well, I guess you have to read this, don't you...) and imagine yourselves in a lesson with an investigator. Just you, your companion, and the investigator. I want to discuss the 4th person there with you. As you all know, the spirit is a constant presence but you don't feel his presence constantly at one level, it fluctuates as your speed in a car in the city, it always going up and down. When teaching a lesson, the spirit will touch their hearts, but there is always one point in a lesson (if the spirit is with you) where the spirit will be the strongest. This is called the Peak. The goal should be to quickly get the spirit into the room, teach the lesson, bear your testimony, and then get them to commit to something such as baptism or prayer or church. The spirit will fluctuate a bit, but when you bear your testimony, it will skyrocket, this is the time when the investigator will think and ponder, and most importantly, feel the spirit the strongest. Just a few seconds after this point is reached and a few seconds of silence have been observed, that is when you invite them to come closer to Christ (via commitments). This happened in a lesson we had a few days ago. The spirit was there, and we felt the spirit, and we reached what we felt was a peak near the end of the lesson, but we decided not to act on it. We continued to teach for a bit, and then, when all 6 of us bore our testimonies, we reached the true pinnacle of the influence of the spirit far overpowering the feeling we had before. Using this power and feeling, we invited the investigator to be baptized, and he accepted. The spirit then, was possibly the strongest I have ever felt in my life, in that moment erased any possibility of doubt that this work is the work of god. His work. This truly is his work. I wish you all well in the week to come and you will hear from me next week. Until then, God be with you.